Twitter is an online social networking service used to send short 140 character messages that are called as tweets. In the content marketing world today, Twitter has undoubtedly become a platform for voicing the strongest of the opinions. According to recent industry figures pertaining to the social media industry, Twitter has the most active users. We can also see the prominence of this platform and its increased usage during events. Live – tweeting of events has become a popular way to engage online, for users to put their thoughts through and for brands to send out brand specific messages. According to U.S. Millennials, live-tweeting events make them more fun and 67 percent of them would also follow hash tags which are related to events. Twitter was created in March 2006 by Jack Dorsey, Evan Williams, Biz Stone, and Noah Glass and launched in July 2006. Jack Dorsey sent the first ever Tweet on 21 Mar 2006. Some impressive statistics of Twitter in 2017 are listed below. Twitter users send more than 500 million Tweets per day. At present, Twitter is valued at $16 billion. As of Feb 2017, 90 percent of the U.S. population was aware of Twitter, this makes it the second largest after Facebook. Twitter is available in 40 languages worldwide. 24% of all males users on the internet and 21% of all internet female users use Twitter. There are over 67 million Twitter users in the US alone. Twitter launched its newest feature – Live streaming as of March 2017. Katy Perry was the most-followed celebrity on Twitter with more than 96 million followers. 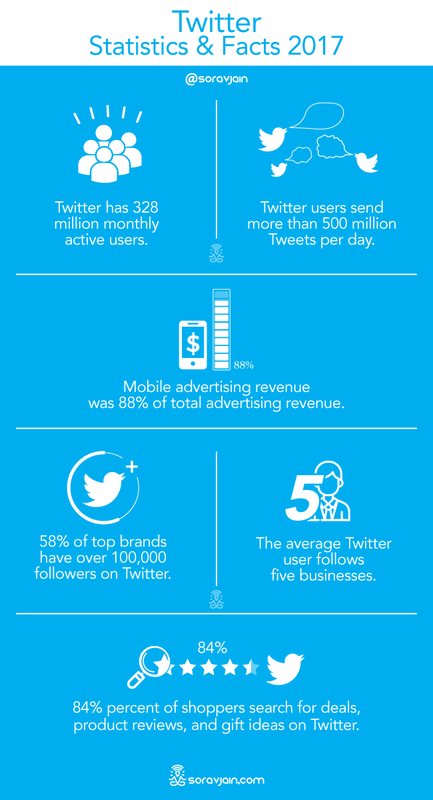 Twitter’s advertising revenue in the US is projected to be approximately $1.15 billion in 2017, in mobile ad revenue. Twitter can handle an astounding 18 quintillion user accounts. A day’s worth of Tweets would fill a 10 million page book. 58% of top brands have over 100,000 followers on Twitter. Tweets associated with images receive 18% more click throughs, 89% more likes, and 150% more retweets. Twitter is an important platform for customer service – American Airlines alone receives more than 100,000 questions, complaints, and comments every month. 84% percent of shoppers search for deals, product reviews, and gift ideas on Twitter. Instagram is definitely the most visual platform available today and is also the fastest growing social platforms in the world. It has been named “one of the most influential social networks in the world” at present. Creative images and quirky captions are one thing, added to that are the hash tags and keywords that helps you build a community of followers and creates a virtual presence for an individual or a brand deeming to have a social presence. Instagram has the highest user engagement too. Launched in 2010, as of April 2016, the reach had reached to 700 million. That means that the reach and its ability to grow more is nothing but absolute. It is predicted that it will soon reach the number of engaged users that Facebook and WhatsApp enjoy. Here is a list of interesting and engaging facts about Instagram. There are over 40 billion photos and videos shared on Instagram since its conception. 8 million registered businesses having their business profiles on Instagram. There are more than 500,000 advertisers on Instagram and growing. There are 1 million monthly active advertisers. In March 2017, over 120 million Instagrammers visited a website, got directions, called, emailed, or sent direct messages to learn about a business based on an Instagram ad. eMarketer projects that Instagram’s global mobile ad revenues will reach $2.81 billion this year. 59% of internet users between the ages of 18 and 29 are on Instagram. Clarendon, Juno and Gingham are the top filters used across the world. Instagram is currently used by 48.8% brands. 5% of Instagrammers take action after being inspired by a post, like visiting a website, searching, shopping or telling a friend. The top brands are Nike which has 68.1 million followers followed by National Geographic which has 65.7 million followers.